Credit Suisse expects U.S. sports betting net revenues to surge to $4.5 billion by 2023 and continue climbing as legalization spreads. UK-based William Hill is in a very strong position to capitalize on the widening market. The day the U.S. Supreme Court overturned a ban on sports betting on May 14, William Hill US CEO Joe Asher invited his employees to celebrate the occasion at the SLS Las Vegas on the Strip. The historic decision opened the door to huge growth potential for Nevada’s largest sports book operator, with a 31 percent market share. Asher wanted to savor the long-awaited moment with his team over food and drinks. Credit Suisse expects U.S. sports betting net revenues to surge to $4.5 billion by 2023 and continue climbing as legalization spreads. British-based William Hill is in a very strong position to capitalize on the widening market. 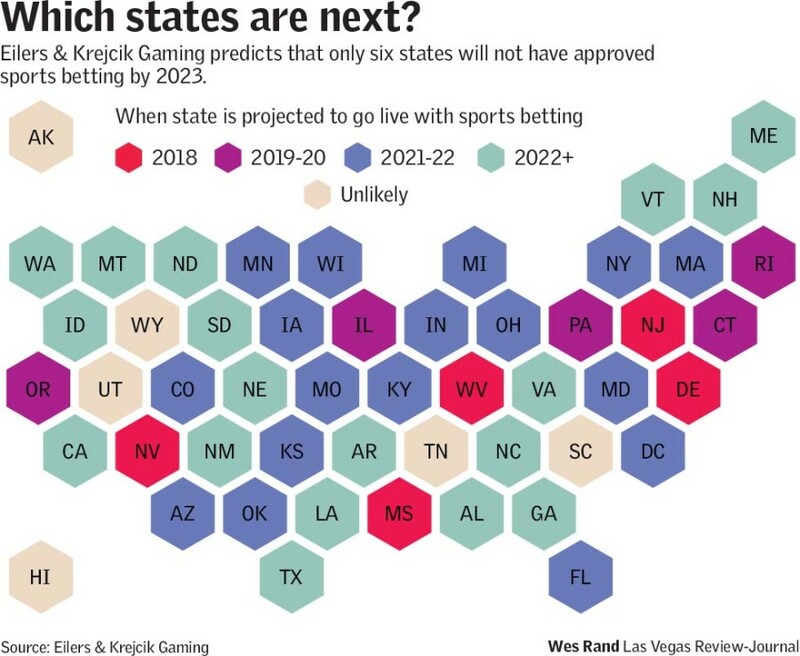 Four states have launched sports betting since May, and research firm Eilers & Krejcik Gaming predicts 44 states will have approved sports betting by 2023. The SLS celebration was a pause in an intense period of investment, travel and negotiations for Asher as he seeks to grab as big a slice of the nascent market as possible. The company went on a hiring spree in December to ensure it got out the gates quickly when the court ruling came. Big competitors are already snapping at his heels. GVC Holdings, a British-based wagering company, signed an agreement with MGM Resorts International in July that would give it a mobile presence in as many as 15 states. FanDuel, the popular daily fantasy sports operator owned by British-based Paddy Power Betfair, reached a sports betting partnership with Boyd Gaming Corp. in August. Boston-based DraftKings, another fantasy sports operator, launched online betting in New Jersey and is hiring in Nevada as it seeks to build its sports betting division. FanDuel and DraftKings have greater name recognition around the U.S. than William Hill US, said Chris Grove, managing director at Eilers & Krejcik. “Ask a sports bettor in New York if they’ve heard of William Hill, and it’s probably a coin flip or worse. Ask them if they’ve heard of DraftKings or FanDuel, and it’s virtually a lock that they have,” said Grove. FanDuel and DraftKings are active in more than 40 states and have about 8 million customers each. That is keeping Asher hustling. He has been crisscrossing the U.S. to hammer out agreements with casino operators, sports teams and leagues while pushing into new states. He is sometimes on the road twice a week. Asher has something to show for it. William Hill US last week announced a cross-promotional partnership with the Vegas Golden Knights, the first deal between a sports book and an NHL team. The Knights’ partnership came two weeks after William Hill’s agreement with Eldorado Resorts, one of the largest U.S. casino operators. William Hill will have exclusive rights to manage its sports books, and Eldorado will receive a 20 percent stake in the company. Since May, William Hill has opened sports books at properties in New Jersey, Mississippi, West Virginia and Delaware and will be operating in Rhode Island and possibly Pennsylvania later this year. The New Jersey expansion also includes online wagering. Companies and startups are calling to see how they can participate in the wagering boom, he said. Buffalo Wild Wings said in August that it was exploring how to monetize the sports fans who patronize its restaurants. Asher did not disclose whether he was speaking with Buffalo Wild Wings or similar restaurant chains. While William Hill has made the most visible advances among its peers, some question its strategy. Eldorado competitors could view its William Hill stake as a potential conflict of interest, said Vic Salerno, former chairman of William Hill US and now president of USBookmaking. Salerno is seeking to compete with William Hill to manage books in states that are legalizing sports betting. 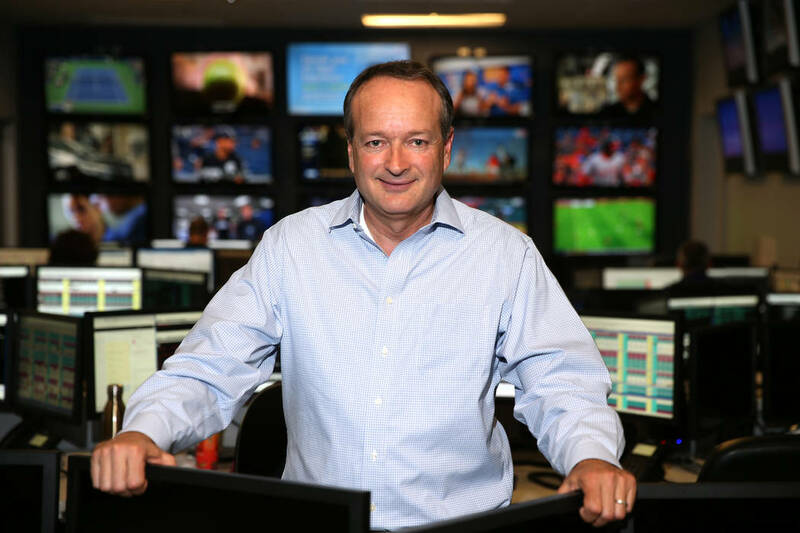 William Hill was the first major international sports book operator to bet big on the U.S. market, enabling it to leap out of the gates in May. In 2012 it acquired three Nevada bookmaking companies — including Salerno’s American Wagering, Asher’s Brandywine Booking and the Cal Neva Sportsbook Division — for a total of $55 million. Asher took the helm of William Hill US after his company was acquired. It took six years for the sports betting ban to be overturned, but William Hill has more than recouped its U.S. investment. Profit at its existing U.S. operations more than doubled in the first half of 2018 to $24.3 million, driven in part by wagering on the Knights. William Hill spent $17.2 million on U.S. expansion efforts over the first six months of 2018 as it hired staff and prepared to launch in new states. Expansion costs could jump to $60 million in the second half of the year as it builds out Eldorado sports books. Reno-based Eldorado will operate 26 casinos in 13 states when it completes its acquisition of Tropicana Entertainment next month. The expansion costs are expected to offset any profits in 2018 for William Hill US. The British parent said in its earnings release in August that the potential long-term gains are well worth the short-term pain from rising costs. William Hill US has hired about 150 people since the end of last year and plans on hiring more as it enters new states. That is causing growing pains at its headquarters on South Rainbow Boulevard. The company can no longer fit them all into the same building, forcing William Hill to rent space nearby. “We are trying to figure out how best to do it. Ideally we would have everybody in the same building,” Asher said.